Hello guys! Before I leave town for Tokyo I want to share with you a recent Althea product, the Petal Velvet Sunaway SPF 50+ PA++++ Sunscreen. Hey guys! Today I’m doing a short review on Klairs’ Rich Moist Soothing Serum, Supple Preparation Facial Toner, and Toner Mate 2 in 1 Cotton Pad. 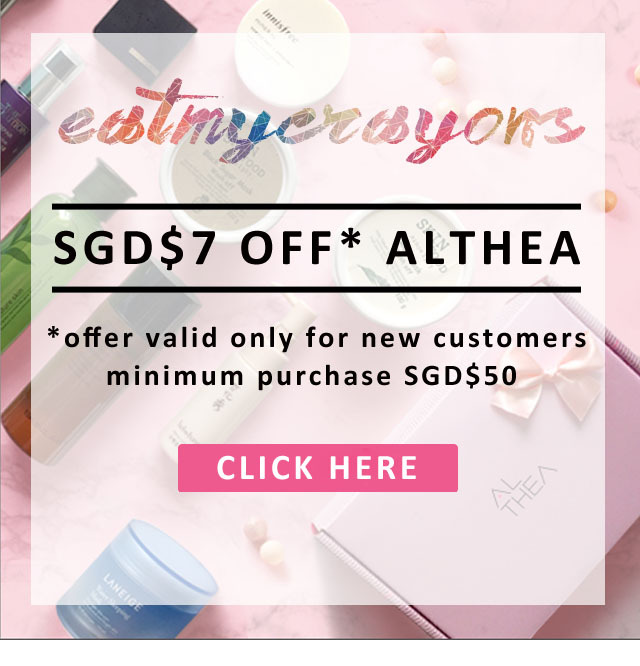 I was lucky to be selected by Althea to receive this skincare set which is targeted at dry/aging skin. I personally feel its never too early to start on anti-aging skincare regimes as over the years I have noticed that my skin is less taut and supple than before. I try to put on lesser makeup now and instead focus more on supplementing my skin. This kit contains a toner, serum, and a box of Klairs’ 2 in 1 cotton and sponge pads. I recently went on a makeup bag replacement binge, and swapped out my Watt’s Up highligher for the Aritaum real ampoule highlighter. The korean highligher reminds me of drawing markers, with a click button on the end. Hands up if you live in a hot & humid country. Hands up (again) if you have been actively looking for something to curb the 4-hour post-makeup oil slick. That’s me, and I believe I am not sorely alone. I think I can safely say many girls will agree that finding a reliable oil control product is akin to sifting through a mountain of well, oil control products. I perpetually live on deoderant. While there are many name-brands out there promising everlasting freshness and odour-blocking abilities, I’ve never once found something as formidable as the Rohto Deoball deoderant. “It’s beginning to look a lot like Christmas..🎄”. Yes, 2017 is coming to a close and it has been a really good year. To get into the spirits of things I popped out my Lush shower jelly, aptly named Santa’s Belly. While I’m progressively working through my stash, the product I have is not of the latest packaging. The newest Santa’s Belly is resembling a bit like a Pokeball, though I know it’s meant to look like Santa’s signature costume with the belt. Did I enjoy it? Yes. Will I want more of this? Why, yes! Today I’m going to talk about soap. Specifically, the Cow Brand Beauty Soap Kyoshinsha. The one I have is the red box, which is extra moisturising and costs a little bit more than the blue box, which is the regular formula. I’ve long heard accolades about this bar soap, of it being gentle, no frills and generally good for your skin. Another perk was the price, the soap is inexpensive when compared to counterparts like shower foams and gels. In short, after using the product for about 2 months, I’m a fan. I hoarded half a dozen of this from my recent trip back to Tokyo. Thank you for noticing Heidi: beauty junkie & Bachelor in Mass Comms (RMIT). A digital marketing manager by day, she has an insatiable appetite for writing reviews in her free time. She adores all things colourful and collects toys. Heidi's 170cm | UK8, lives in Singapore. Photos are taken with the Nikon S6700. EMC may occasionally feature sponsored/affiliate posts. Note that regardless the origin of products, all thoughts and reviews are 100% honest and based on my personal experience. All digital content rights reserved, please seek permission for use. I’m a Sample Store Seeder!